The Government says it is putting poverty on the agenda. That’s good, but what does it mean in practice? The signs are worrying. Announcements so far show it will be limited tightly to those in the harshest poverty, cover only housing, transport, childcare costs and loan-shark debt, and rather than provide new resources will largely rearrange current spending. These may contain small steps in the right direction but they fall well short of addressing the much wider problems of poverty and high income inequality. They have their own problems: tight targeting creates poverty traps and strips people of dignity by controlling their lives. It is a charity state, not a welfare state. But the big question is: can the Government make a real difference without significantly raising incomes? I suggest that it can’t. This matters for wage and salary earners as well as beneficiaries because it is about wage as well as benefit levels. People may not realise how low benefit levels have fallen. OECD comparisons show they are now among the lowest in the OECD relative to average wages. They could be raised by a quarter relative to wages and still be no higher than they were after being slashed in the 1991 Budget. The impacts reach much further than people in poverty. 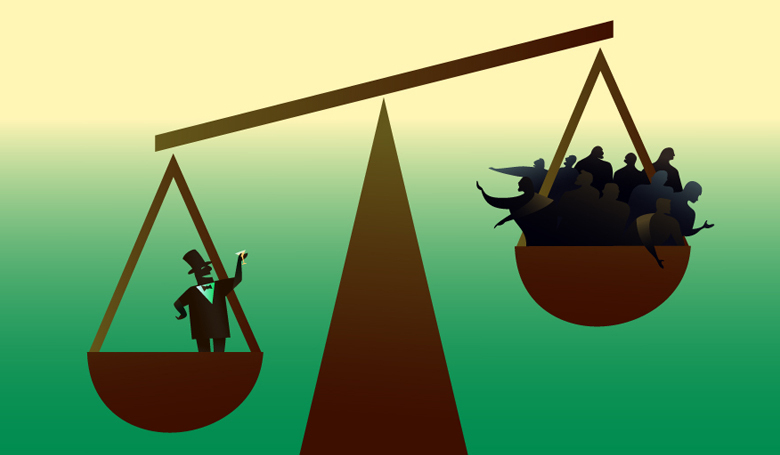 Recent OECD research (Cingano, 2014) which found that higher inequality leads to lower economic growth said that poverty is only the extreme end of a problem that reaches much further up the income scale. It had no doubt that higher welfare benefits and more progressive taxation were a part of the solution. But it also said better “pre-distribution” is needed. In other words we also must reduce inequality at its source: wages. According to the Ministry of Social Development’s Household Incomes Report (Perry, 2014), half of the children in hardship come from working families. For two-parent families, wage rates and hours worked are the most important factors affecting their incomes. Restoring the value of Working for Families would be a start. Its real value has been falling since 2010 according to Treasury Budget data, accelerated by 2011 Budget changes. Raising wages would be even better. That requires employment law changes to strengthen collective bargaining, raising the minimum wage, more money for education and training, stronger controls on immigration, and rules to ensure vocational training is rewarded by higher wages. But the fact remains that being born into a family reliant on a benefit is close to a guarantee of poverty. Benefit levels matter for wage and salary earners too. 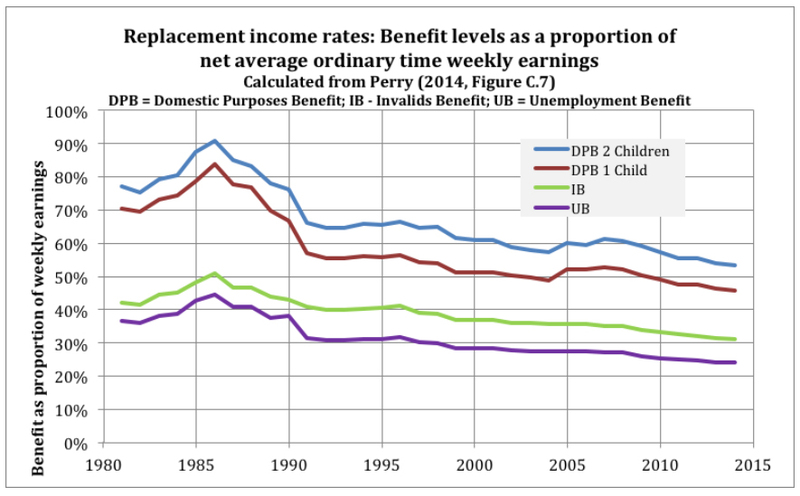 When a crisis strikes, the “replacement income” from benefits is often crucial. Redundancy, relationship breakup, the death or serious illness of a partner can all be devastating to a family’s finances on top of the emotional turmoil. If replacement income is low and people have little savings, they may be forced to accept lower wages, a job they’re unhappy in, or one that doesn’t match their skills and experience. Desperate job-hunters lower pay rates, affecting the incomes of many others. New Zealand’s high job turnover means this matters even more. From an economic point of view, if some job turnover is necessary to replace low productivity firms with higher productivity ones, then the cost of it should not land on the employees affected. Society benefits from higher productivity and so has a responsibility to help them through these times without significant financial penalty. For injury, ACC’s replacement income rate is 80 percent of our usual incomes. Why should it be so much lower if we become unemployed? The Government says increasing the level of benefits might reduce the incentive to work. But there is an incentive to work if benefits are only moderately less than what people earn in their jobs (as for ACC). Benefits don’t have to be at poverty level. In fact the gap between benefits and wages has been growing steadily since 1991. Benefits have been adjusted only by inflation while wages, though rising more slowly than the economy could afford, still rose faster than inflation. The graph, calculated from the Household Incomes Report, shows the fall in replacement income rates as a percentage of the net average weekly wage. They peaked briefly in the mid-1980s due to the wage freeze but the fall really opened up from 1991. Some of the gap has been filled by an array of second-tier and third-tier benefits which have become increasingly intrusive and demeaning for beneficiaries and add to poverty traps. Available statistics don’t allow us to judge accurately just how much of the gap they fill. Even lifting the equivalent of the Domestic Purposes Benefit by a quarter would provide a replacement income rate no higher than after the 1991 cuts. Lifting it by 45 percent would take it back to 1990 levels. For the unemployment benefit, a lift of one third would take it back to 1991 and almost 60 percent would be needed to restore the 1990 level. If National thought the lower benefit levels it set in 1991 were enough to “incentivise” employment then it should find a substantial rise in current benefits acceptable. But higher replacement income rates before the 1980s co-existed with much lower unemployment rates than since the 1990s. Labour force participation rates in 2014 are little higher than in 1986. A single parent with two children in New Zealand receives 54 percent of the average wage according to OECD data comparing benefits during the first years of unemployment for families qualifying for cash housing assistance or social assistance “top ups”, whereas the OECD median is 70 percent, Denmark pays 77 percent and Canada 84 percent. New Zealand benefits rank 25 to 28 out of 33 OECD countries for this family – and bottom for some two-earner couples with two children. The “incentives” argument is a crock. Good wages, income security, lowered income inequality and ridding New Zealand of high levels of poverty all demand realistic benefit levels. Note that these rates do not include the Accommodation Supplement or the subsidy received by those on income-related rents; but these are not received by all beneficiaries and are also available to low income wage earners and so are difficult to compare accurately. Bill Rosenberg was appointed Economist and Director of Policy at the Council of Trade Unions in May 2009. He holds a B.Com in Economics, a BSc in Mathematics and a PhD in mathematical Psychology. 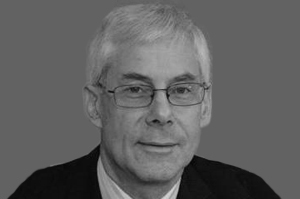 Bill was previously Deputy Director, University Centre for Teaching and Learning at the University of Canterbury, a member of the Institute of Directors, a Commissioner on the Tertiary Education Commission, and a member of the Regional Transport Committee of Environment Canterbury. Dr. Rosenberg is widely published on globalisation, trade and e-learning and has been an active trade unionist for 30 years including the Tramways Union and the Association of University Staff where he was National President for several years.